Research increasingly suggests that addiction has a genetic and neurobiological basis, but efforts to translate research into effective clinical treatments and social policy needs to be informed by careful ethical analyses of the personal and social implications. Scientists and policy makers alike must consider possible unintended negative consequences of neuroscience research so that the promise of reducing the burden and incidence of addiction can be fully realized and new advances translated into clinically meaningful and effective treatments. 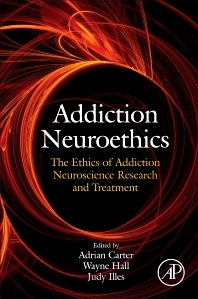 This volume brings together leading addiction researchers and practitioners with neuroethicists and social scientists to specifically discuss the ethical, philosophical, legal and social implications of neuroscience research of addiction, as well as its translation into effective, economical and appropriate policy and treatments. Chapters explore the history of ideas about addiction, the neuroscience of drug use and addiction, prevention and treatment of addiction, the moral implications of addiction neuroscience, legal issues and human rights, research ethics, and public policy. Introduction: What is Addiction Neuroethics and Why Does it Matter? Professor in the Department of Neurology and Research Chair in Neuroethics for the University of British Columbia, Dr. Illes is also Co-founder and Executive Committee Member for the Neuroethics Society. She is one of the leading voices in neuroethics today and has published extensively in this realm (Editor: Handbook of Neuroethics/2011, Neuroethics: Defining the Issues in Theory, Practice, and Policy/2005). She also serves as Chair for the International Brain Research Organization (IBRO), Committee Chair for Society for Neuroscience, Editorial Board Member for Journal of Ethics in Mental Health, and Senior Editorial Advisor for American Journal of Bioethics: Neuroscience.